The Aboa Mare Training Center in Finland has provided training in ice navigation since 2007. During 2016, several new training courses and workshops were added to the training portfolio. For example, training for polar waters is now available. This training fulfills the requirements of the International Code for Ships Operating in Polar Waters, also known as the Polar Code, which took effect on 1 January 2017. Christer Gorschelnik, a Captain by training himself, dropped in to find out what this training actually includes. Aboa Mare is one of the most advanced centers in the world for training seafarers to operate vessels in severe ice conditions with the Azipod propulsion system. The Aboa Mare simulator systems allow using from one to three such propulsion units in training situations. I had an opportunity to follow ice-navigation training Captain Magnus Winberg, an instructor at Aboa Mare, as he trained six deck officers on two simulator bridges to operate a 300-meter-long and 50-meter-wide LNG tanker, designed to carry natural gas from Sabetta in Russia to Europe and the Far East. The vessel has a double-acting function, which means that it can also proceed stern first, significantly improving its ice-breaking capability compared to steaming bow first. As a result, the vessel has two bridges, one facing forward and another astern, both of which have identical navigation and other equipment. The vessel does not have side thrusters, which are not required, because the Azipods also perform the function of thrusters. At the beginning of the training session, the trainees had difficulty in synchronizing the performance of the Azipods so that their position and power would be optimized to make the vessel proceed in the intended direction. After almost an hour of practicing, arrivals in por t and departures from them started to go well, although Winberg from time to time increased the demands on his trainees. This is because in real life, surprises can arise and then the master will have to make quick decisions and put them into practice. The purpose of the training session was to give the masters the tools they need to solve problems as they occur. The above-mentioned simulation training was performed using the NTPro 5000 ship simulator, which includes an ice-navigation module. Aboa Mare is, through the ASTP-project (Arctic Simulator Training Program), involved in developing a new type of ice-navigation simulator in cooperation with Aker Arctic Inc.’s simulator development team, Simulco Oy and Image Soft Oy. This simulator is expected to be the foremost ice-navigation simulator when it is completed. It has already been used for training officers of the new Finnish icebreaker Polaris, built by Arctech Helsinki Shipyard, on how to operate their groundbreaking new vessel. Aboa Mare has more than a decade's experience of ice-navigation training. Every member of its training staff involved in ice-navigation training is a captain who has long-term personal experience from operating vessels in ice conditions aboard both icebreakers and merchant vessels. Consequently, the staff is fully versed in the capabilities of the simulators, which are being fur ther developed to present even more challenging conditions. Finland has a lot of competence related to operating ships in ice conditions. However, the ice on the coasts of the country is single year and therefore not as hard and thick as multi-year ice, which seafarers will encounter in the Arctic and Antarctic. The simulators allow for adjusting the thickness of the ice to the size of the vessel, the handling of which is being simulated. Ice behaves in the same way in all par ts of the world, and the thicker the ice, the more power and displacement you will need to proceed through it. The equipment allows for the simulation of encounters with solid ice, ice ridges, icebergs, growlers and drifting ice fields that cause ice pressure against the hull of a ship, plus a situation in which the bow of the vessel is stuck in solid ice and the stern in a drifting field of ice. Vessels with inadequate engine power and insufficient ice-strengthening have been badly damaged by ice pressure. There have even been cases where ships have been lost, as vessels stuck in ice have sunk as masses of ice have risen on the deck and caused the vessel to founder. The simulators also make it possible to create more challenging conditions by mimicking snow storms and icing in hard wind and below-freezing conditions (icing results from the spray of water in heavy weather conditions at below-freezing temperatures.) This will quickly result in ice formation on the superstructure of a vessel. A significant ice load will reduce the stability of the vessel concerned, and it may even result in loss of stability and capsizing of the vessel unless the ice is removed from decks on time. On icebreakers, decks are kept free from snow and ice by placing panels heated by electricity to places where the crew frequently go. Officers must be aware of the dangers of icing when their ship sails in heavy weather conditions with the temperature well below the freezing point. During my own time at sea I have faced icing, and I must say that it was not a pleasant experience. Chapter 12 of the Polar Code sets the levels of manning and training that are required. Its goal is to ensure that ships operating in polar waters are appropriately manned by adequately trained and experienced personnel. The Polar Code certificate is mandatory for all officers sailing in Arctic and Antarctic waters, while the level of training depends on ice conditions in the area to be operated. Open water: Basic training for master, chief mate and officers in charge of navigational watch. Other waters: Advanced training for master and chief mate; basic training for officers in charge of navigational watch. The Polar Code also stipulates that deck hands must be trained to handle their responsibilities in ice-covered regions at high latitudes. This includes keeping the decks free from ice and ensuring that all equipment is working even when temperatures fall well below freezing. Local legislation dictates whether an icebreaker should accompany the vessel and whether an ice pilot, with a good capability to analyze ice fields in the path of the vessel, should be carried onboard. Those who have operated vessels in nor thern waters are usually well acquainted with navigating a vessel through ice, and therefore, they know how to deal with simulated events. Other trainees, who only have experience with open-water navigation, will face several situations that they probably had not encountered at all prior to the star t of training. Consequently, the training staff will have to dedicate a lot of time to improving the skills of these trainees. 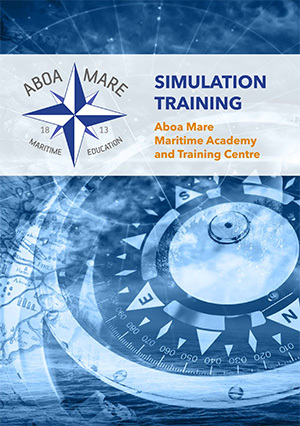 The Polar Code course of Aboa Mare allows simulating and practicing events on various types of ships. The training can include icebreaker assistance to free a merchant vessel that is stuck in solid ice or an ice ridge or a ship that is being pressured by ice. Simulations can also include sailing in a convoy in the wake of an icebreaker and towing of a merchant vessel by the icebreaker. A towage operation in par ticular is very challenging for most trainees, both the officers and crew, and this is especially true for those that have not experienced this before. The icebreaker will pull the merchant vessel to the towing fork in its stern by a powerful winch. This makes the two ships almost like one unit and is one of the most effective ways to get a vessel that has been stuck in ice on the move again. Training for ice navigation with Azipod propulsors has been developed together with ABB Marine and Por ts, par tly using knowledge and skills acquired in delivering specialized training for Azipodequipped cruise ships since 2010. Experience has shown that Azipods are at their most effective in ice conditions in the doubleacting mode, when you sail the vessel stern first through thick ice, ice ridges and all kinds of heavy ice conditions. Then the propellers will cut and flush their way through the ice much more efficiently than if you ram the ice wall bow first. “Our experience shows that a vessel fitted with Azipods can be operated much more efficiently, and lowering the maintenance costs, provided that you know how to adjust the pods correctly in relation to the direction of the vessel. This too will be practiced in the simulator,” Winberg said. It is important to train officers to operate a vessel that has Azipods, even in open-water conditions, because of the handling qualities of these vessels. “In narrow fairways, a ship fitted with pods handles differently in turns than a traditional vessel that is fitted with a rudder,” said Mikael Hildén, who is a Captain with experience operating large cruise ships of both types. “The center point of the vessel, around which it turns, is located at a different point compared to a ship with a traditional propulsion system, in which it lies halfway between the bow and stern. When there is a turn in the fairway and you alter direction, pods will push the stern of the vessel to the side of the midpoint of the fairway. During the turn, the stern does not follow the bow in the midpoint of the fairway; in other words, the stern of the vessel will be significantly off the center line of the fairway on one side, even at the time when the bow has reached the midpoint of the fairway on a new course,” he continued, adding that this should be taken into account; otherwise, there is a risk that the stern may touch the side of the fairway. Polar regions are environmentally sensitive, and in this writer’s opinion, when a cruise ship reaches a place in polar waters where it will stop, it would be better to rely on a Dynamic Positioning (DP) system than on dropping the anchors. This will prevent damage to the seabed. However, Winberg said that in drifting ice conditions, the DP system will probably not work. It quite simply cannot deal with ice, an element that it does not know, and therefore semi-automated operations must take over. The DP system would react to ice as if it was influenced by wind and/or current, trying to keep the ship stationary. However, the only way this would work is if the ship is turned bow first into the drifting ice. If the ship is at even a small angle, the force of the ice would overwhelm the system, it having not enough propulsion power to keep the ship sideways (not to mention that the hull of the ship is not designed to being pushed sideways in the ice). It is unlikely that cruise ships will be built with such powerful DP systems in the future so that they could employ them to remain stationary under ice conditions. Winberg, who is well acquainted with the rules of the Polar Code, pointed out that requirements increase the fur ther into cold regions that you want to sail. In addition, Canada has introduced very tough requirements of its own. Chapter 8 of the rules say, among other things, that adequate thermal protection shall be provided for all persons onboard, taking into account the intended voyage , the anticipated weather conditions – temperature and wind – and the potential immersion in polar water, where applicable. All equipment must be certified according to the Polar Code. In polar regions, there will be many kinds of weather during the winter season, and authorities of coastal states follow the movement of ice and its thickness, both by using satellites and flight reconnaissance. This information is then passed on to ships, and weather forecasts also include warnings about the risk of icing. In the past, icebreakers used to conduct their own short-range reconnaissance using helicopters, which are likely to be replaced by drones due to their lower cost. There is good radar equipment on the market that is capable of detecting ice, and a specialty software package can be linked to ice radar, which can analyze the ice and detect ice ridges and drifting ice. Infrared cameras are also a good tool for navigating in ice conditions. Open water is warmer than frozen water, and thin ice is warmer than thick. This equipment can also detect growlers.